During that period, all project donations will benefit this project, Photocircle will triple its own donations and many of our artists will increase their donations as well. Help us help Syria and simply buy a beautiful art print for your home - we'll take care of the rest. The situation on the ground: more than 13.5 million Syrians including six million children, are in need of humanitarian assistance and protection inside Syria. About 7 million people remain internally displaced. Almost 70% lack access to adequate drinking water. One in three people are unable to meet their basic food needs. After years of war millions of people have lost everything. Houses, hospitals and schools have been destroyed. Syria’s development has regressed by almost four decades. Since the onset of the crisis, the average life expectancy has fallen by 20 years. 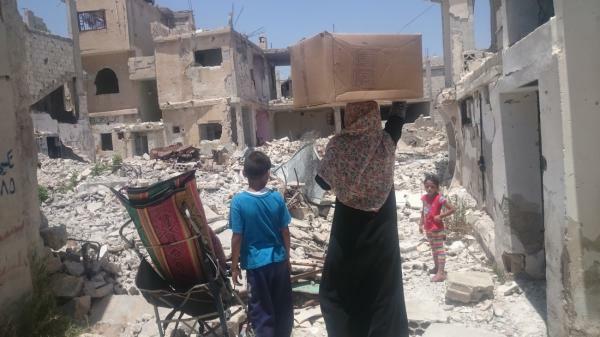 In total, CARE has reached more than 1.6 million people in Syria so far. CARE mainly focuses on the distribution of relief supplies such as food baskets, hygiene and baby kits, dignity kits for the elderly, and kitchen sets. During the harsh winter, our partners have supported families with mattresses, blankets, floor covering, and children’s clothing. CARE’s partners also work with health clinics, increasing access to health care for Syrian communities affected by the conflict. Additionally, women receive reproductive health support and CARE is also supporting the renovation of two water treatment plants. In addition to incredible humanitarian needs, in such a protracted conflict there is also an urgent need to rebuild livelihoods, and encourage social cohesion as well as resilience to cope with longer-term crisis. With their partners, even in besieged communities, CARE is developing resilience programs, providing families with livelihoods support, including agricultural production, microfinance and psychosocial programming, in addition to providing access to clean water, improved sanitation, and hygiene. CARE partners with local Syrian organizations providing humanitarian relief in Syria, many of whom started at the beginning of the crisis. We support them in building their capacity, experience and understanding of humanitarian principles, standards and operations. CARE was supporting a partner-operated community kitchen in eastern Aleppo until October, when the humanitarian blockade prevented further assistance. CARE continues to support partner agencies providing emergency food baskets, hygiene kits, mattresses and blankets to displaced families in the countryside outside of Aleppo. CARE has provided over 17,000 displaced Syrians in rural Aleppo with emergency food baskets, winter kits (including matrasses, sleeping mats, blankets, plastic sheeting) and hygiene kits. CARE, through partners, is also engaged in hygiene promotion and protection activities.